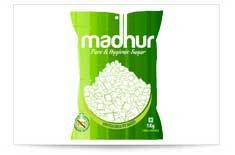 Madhur, launched in 2007 is the well-established retail brand from the Shree Renuka Sugars stable. At Madhur we strive to create products that are pure, hygienic and meet international standards. Special care is taken during cultivation, harvesting and onward processing and the Company’s advanced sulphur free manufacturing technology and mechanised processes guarantee the purity of the sugar, while giving the sugar crystals its optimum size. 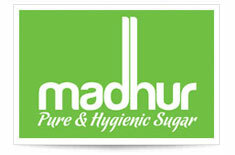 Madhur has emerged as the fastest growing brand in the sugar category with a CAGR of 46% within 5 years of its launch. Madhur has a signiﬁcant presence in local kirana stores in Karnataka, Gujarat, Maharashtra and Rajasthan and it also finds a place of pride on the shelves of leading food malls and food chains. With the promise of premium quality, purity and hygiene, Madhur is one of the fastest growing sugar brands in the country enjoying leadership status. Looking at the increasing popularity of Madhur, plans are on the anvil to extend its retail presence pan-India.